Saint Amphilochius, who was born in Cappadocia, shone forth in asceticism and divine knowledge even from his youth. 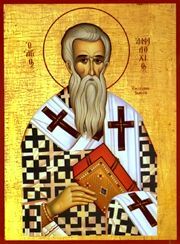 He was consecrated Bishop of Iconium in 341, he struggled courageously against the blasphemies of Eunomius, Macedonius the enemy of the Holy Spirit, and the followers of Arius. He was present at the Second Ecumenical Council of the 150 Fathers, which took place in Constantinople, convoked during the reign of Theodosius the Great in the year 381. In 383 Amphilochius wished to persuade the Emperor Theodosius to forbid the Arians from gathering in Constantinople and to commit the churches to the Orthodox, but the Emperor was reluctant to do such a thing. The next time that Amphilochius entered the palace, he addressed Theodosius with proper honour, but slighted his young son Arcadius in his presence. Theodosius was indignant, and said the dishonour shown to his son was equally an insult to himself. To this Saint Amphilochius answered that as he would not suffer an insult to his son, so he ought to believe that God is wroth with those who blaspheme His Only-begotten. Saint Theodosius understood and admired Amphilochius' ingenious device, and he issued the desired edict in September of the same year. Saint Amphilochius, having reached deep old age, reposed in peace about the year 395. Saint Basil the Great wrote many letters to Saint Amphilochius, his friend and Fellow champion of the Faith, and at his request wrote his treatise On the Holy Spirit, which besides demonstrating the divinity of the Holy Spirit and His equality with the Father and the Son, defends the Church's unwritten ancient traditions, such as making the sign of the Cross, turning towards the East in prayer, no kneeling on Sunday, and so forth. O thunder divine, thou husbandman of faithful men, the Spirit's clear trump, O axe that hewest heresies, Hierarch Amphilochius, thou great servant of God the Trinity, ever with the Angels on high cease not interceding for us all, O Saint. Share the feast of Amphilochius, Bishop of Iconium with an icon greeting ecard.